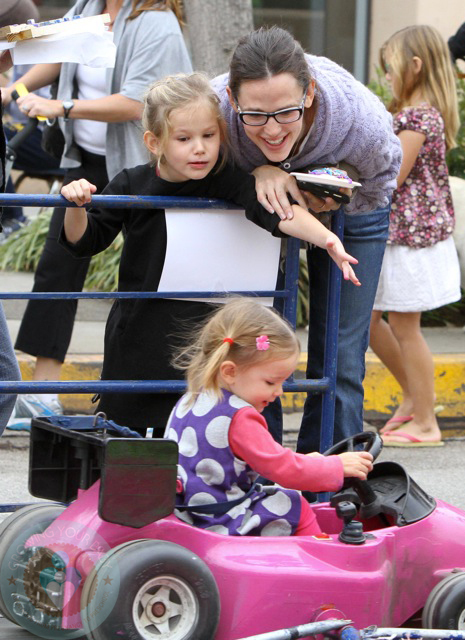 A casual Jennifer Garner was spotted out yesterday with her daughters Violet and Seraphina Affleck at a Hanukkah festival in Pacific Palisades! The girls had fun visiting the Adopt An Animal booth, riding the train, and whipping around the track in the race cars! The trio was joined by Jen’s mom Pat Garner. Ben Affleck is currently filming his latest in Oklahoma, so Jen is on solo duty. One of the busiest family’s in Hollywood, but they always put their daughters first. That is something good to see! Seraphina wears a pair of Abigail Pediped Flex shoes.